A crowdfunding initiative to raise money for family of the police officer killed during the London terrorist attack has received a massive amount of donations. 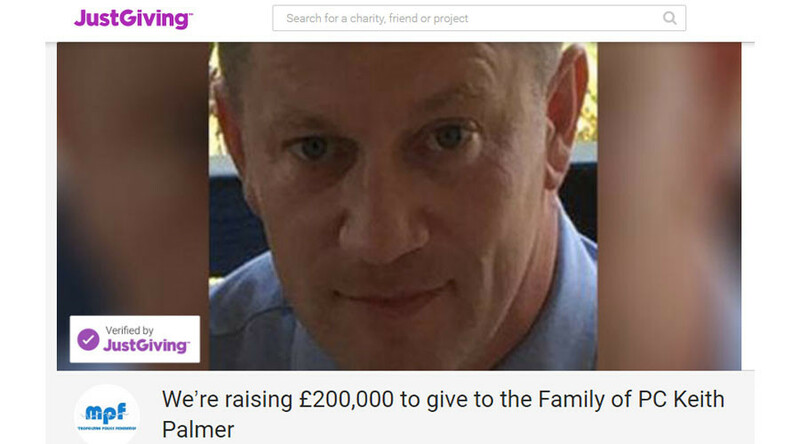 The appeal was initially seeking to raise £100,000 (about US$125,000) to donate to PC Keith Palmer’s family, but due to a wave of contributions, the target was raised to £250,000. The Metropolitan Police Federation (MPF) have now raised over £330,400. The JustGiving appeal was launched on Thursday morning by the MPF, the staff association for the more than 30,000 Metropolitan Police officers. PC Palmer was murdered by Khalid Masood, who killed two other people and injured dozens of others in a terrorist attack in Westminster, central London, on Wednesday. “Every day, all over London and the rest of the UK, Police Officers risk their lives to protect and defend us - in the wake of this tragedy our thoughts are with Keith’s family and all the people who are injured have lost their lives,” a statement on the page said. Many on social media expressed their solidarity with the officer, who was killed while protecting the Houses of Parliament in Westminster.